Arrival in Iceland, transfer to Reykjavik. If your flight lands early in the day, a great suggestion is to explore Reykjavík, the largest municipality in Iceland. Overnight stay in Reykjavík. Breakfast at your hotel. The first day begins with a visit to Thingvellir National Park, the ancient site of the world's first parliament. Here you can see the dramatic continental drift between the North-American and Eurasian tectonic plates. An hour's drive away the popular Geysir geothermal area awaits. The most active geyser, Strokkur, shoots water high into the air every few minutes but you'll also witness boiling pools and hot springs. Next your group will take part in Iceland Travel's reforestation program, located in Haukadalur valley. Help plant a total of five trees, which not only allows you to leave your mark in Iceland but also for your tour group to reduce your carbon footprint! Then it‘s onwards to Iceland's most popular waterfall, the impressive two-stage Gullfoss (“Golden Falls”). Dinner and overnight stay in Hvolsvöllur area. Breakfast at your hotel. 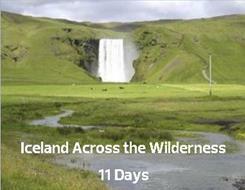 Start the day by driving along the highway, making a stop at two impressive waterfalls; Seljalandsfoss and Skogafoss. Head to the black sand beaches to enjoy the far-reaching views from Dyrholaey headland, where thousands of puffins and other seabirds nest until mid-August. Enjoy a stop in the quaint village of Vik before crossing the Myrdalssandur volcanic ash outwash plains. The day ends after passing through the vast Eldhraun lava field, the world’s largest recorded single lava flow in the last 10.000 years. Dinner and overnight stay in Kirkjubaejarklaustur area for the next two nights. Breakfast at your hotel. The day starts with a drive through beautiful scenery towards Vatnajokull, the largest glacier in Europe, and the country's highest peak of Hvannadalshnjukur. The highlight of the day is surely Jokulsarlon Glacial Lagoon, where huge icebergs dance around in icy seawater. An optional boat tour among the icebergs is available. Continuing on your way, pass by several outlet glaciers from Vatnajokull, visiting at least one of them. Along the route you also will get magnificent views of Skaftafell, a glacier-crowned wonderland within Vatnajökull National Park. Dinner and overnight stay in Kirkjubaejarklaustur area. Breakfast at your hotel. It's finally time to leave the asphalt behind and meander along the Fjallabaksleid interior track to Landmannalaugar, an astonishing area surrounded by colourful rhyolite mountains. The surreal beauty of the uninhabited interior reveals deep valleys and sculptured mountains, many formed in volcanic eruptions under glaciers during the Ice Age. After a nice walk (optional) enjoy a relaxing swim in a warm brook created by the convergence of hot and cold springs. Dinner and overnight stay in the Thjorsardalur area. Breakfast at your hotel. It's time to head north through the very heart of Iceland. Discover hidden treasures of Iceland's uninhabited interior traveling along the Sprengisandur highland route, a vast, barren, black desert connecting the north and south. With only rough tracks and un-bridged glacial rivers, your group will rely on your experienced driver to navigate the rugged passage between the glaciers. (Note: If Sprengisandur is closed, we take the Kjolur highland route instead.) Dinner and overnight stay in the Lake Myvatn area for the next 2 nights. Breakfast at your hotel. After traveling on the gravel roads of the highlands the past couple of days, the smooth highways of the North make the fully-packed day ahead more comfortable. Travel through the town of Husavik and around the Tjornes peninsula, the northernmost point of your journey. Discover the impressive 100 meter (328 feet) high walls of the horseshoe-shaped canyon of Asbyrgi. According to Norse mythology, the canyon is the hoof-print left by Sleipnir, the magical eight-legged horse of the pagan god Odinn. The journey continues to Dettifoss, Europe's most powerful waterfall, which is located in the awe-inspiring Jokulsargljufur canyon. Next travel to the unforgettable Lake Myvatn area, a geological wonderland and paradise for bird watchers. Some of the most visually bizarre attractions in the region include the mud pits of Hverarond and the still-warm lava fields of Krafla, teeming with lava flows, fissures and explosion craters. Dinner and overnight stay in the Lake Myvatn area. Breakfast at your hotel. Start the adventure today with a visit to Godafoss, one of the most impressive waterfalls in the country. Continue to Akureyri, the vibrant "Capital of the North". Enjoy some free time to explore this colourful and charming town. Some activities might include a visit to the delightful botanical garden, a swim in the local geothermal pool, or perhaps enjoying the atmospheric Listagil neighborhood dedicated to culture, art and fine food. The route then continues to the Skagafjordur district, known as the traditional heart of horse breeding in Iceland. This area also boasts many historical sites from the classic Sagas. In the evening, horseback riding on a purebred Viking horse is an appealing option, as is an invigorating walk in the picturesque surroundings. Dinner and overnight stay in the Laugarbakki area. Breakfast at your hotel. The journey continues around Vatnsnes Peninsula, which reveals the extraordinary rock formation of Hvitserkur which is a 15 meter (49 ft) tall cliff jutting out straight from the sea. You might see seals resting close to the beach. In the after-noon, drive through rolling farmlands and across Laxardalsheidi heath to the Viking Age house at Eiriksstadir. This was the original homestead of Erik the Red and birthplace of his son Leif Eiriksson, two of the most celebrated Vikings in the world. In a replica of a grass-roofed house, meet modern day Vikings who demonstrate the lifestyle from 1000 years ago, sharing their crafts and knowledge. Dinner and overnight stay in the Fellsstrond area. Breakfast at your hotel. Today is spent exploring the amazing variety of natural landscapes in Snaefellsnes National Park. Undoubtedly the crowning jewel is Snaefellsjokull glacier itself, which covers a dormant volcano that last erupted in 250 AD. Walk along the uniquely pebbled seascape of Djupalonssandur beach. At the picturesque harbour village of Arnarstapi, you can observe magnificent basalt rock in stacked formations and take a unique walk along the hiking trail linking the settlements of Arnarstapi and Hellnar. Afterwards drive back to Reykjavik. Overnight in Reykjavik. Breakfast at your hotel. Transfer to the airport. We recommend departing your hotel no later than three hours before your international flight.